Nineteen albums in and SAXON continue to showcase its art of doing no wrong, "Destiny" a possible exception. A comparatively diverse album in 2009's "Into the Labyrinth" was easily one of the band's best in years, but no album in recent memory has been anything close to a disappointment. On "Call to Arms" SAXON takes a more direct approach to songwriting; maintaining a degree of variety within its trademark style parameters, but on the whole ending up a more compact example of melodic and classy traditional heavy metal and hard rock. The 11 proper digipack cuts work as a representative career sampling in many respects, though more often than not are most representative of the meat and potatoes side of the SAXON sound. The seven-track "Live at Donnington 1980" CD is also included as a high value bonus. A great opener in the memorably riffed and catchy chorused "Hammer of the Gods" is followed by a big guitar, ode to the old days anthem called "Back in '79". Up-tempo tracks "Surviving Against the Odds" and "Afterburner", as well as the AC/DC-esque "Chasing the Bullet" are demonstrative of the band's no-frills heavy metal rock 'n roll delivery. The tough riffing and marching cadence of "No Rest for the Wicked" delivers in similar form. Melodic hard rock territory is entered on "Mists of Avalon", while a title track that is distinctively SAXON in its epic feel (if not length), and the mid-tempo "When Doomsday Comes (Hybrid Theory)" with its mystical shades and a synth solo to boot, feature a different, though comfortably familiar side of the group. The way this album moves offers a freshness and energy about which most bands a 10th SAXON's age could only dream. Wrap it all up with the THIN LIZZY twin-guitar swing of "Ballad of the Working Man" and a fitting orchestral version of the title track and you end up with another quintessential SAXON release. 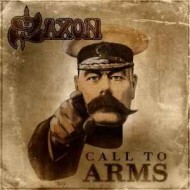 It is without equivocation that "Call to Arms" is highly recommended for any SAXON fan anywhere in the world. You will not be disappointed.